“We have signs downtown, but getting people here is a challenge, and I don’t know what to do to open this up. We’ve got parking, and it is something unique. What more can you ask for?”, asks Jennifer Cole, Collection Manager and Assistant Curator, as she rearranges food plates at the entrance table. Tonight, however, she expects a good crowd. 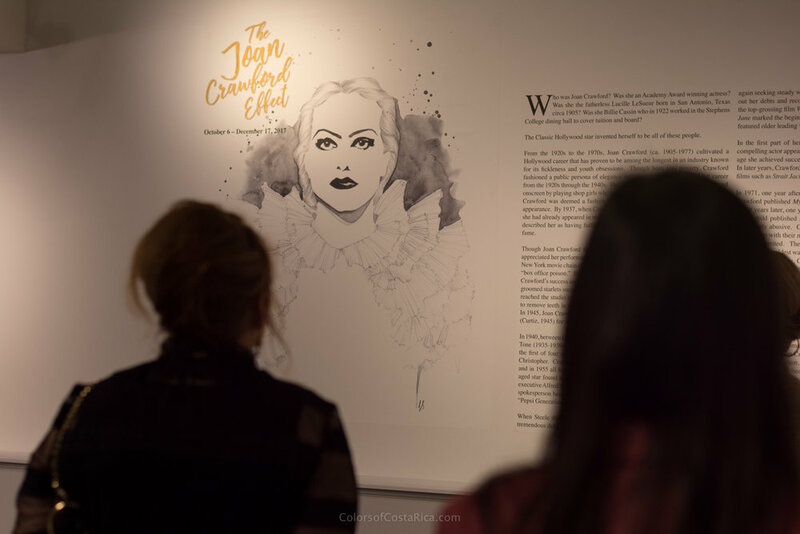 It is the opening of The Joan Crawford Effect, a free exhibit that focuses on how Joan Crawford (1904-1977), American actress and student at Stephens College, and costume designer, Adrian Adolph Greenberg (1903-1959) influenced fashion. Through their collaborations, they sparked an unparalleled interest and demand for the broad-shouldered look. Cheese, crackers and chocolate-dipped cookies, welcome the visitors to the gallery. The typical museum silence is substituted by gentle chatter and the clicking sound of shoes. 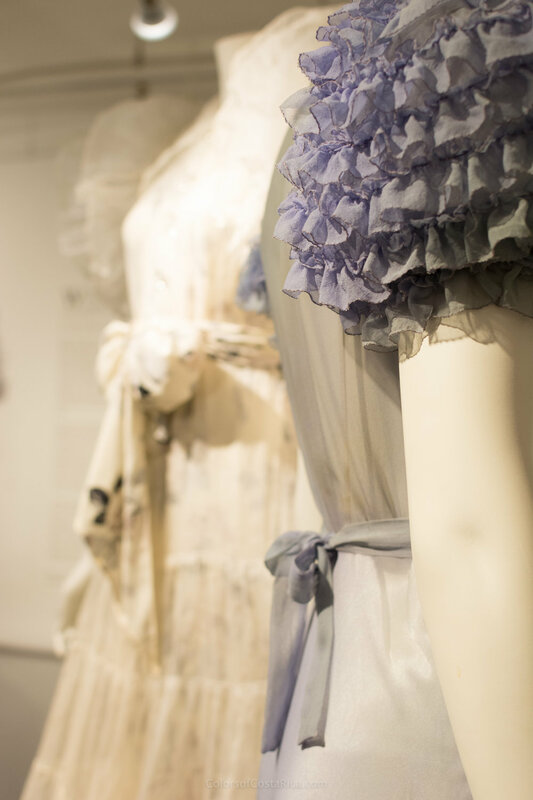 Two dresses, one white, and the other periwinkle, stand in the middle of the room, gleaming under the tenuous light; the shoulders, accentuated by ruffles, look brazenly big. From the waist down, the sheer, organdy fabric falls forming an A-shape. The white dress is a replica of the gown worn by Joan Crawford in the Letty Lynton film, released in 1932. “I like the Letty Lynton gown, mainly for its connection with history. I have worked in museums for seventeen years, and there’s been talk about this Letty Lynton gown, “Oh it inspired all of these mass-produced knock-offs”, and yet no museum has had any copies. So for me, it is not so much the gown itself, which is nice, but it is really the fact that there aren’t very many out there, for whatever reason”, explained Dr. Lori Hall-Araujo, Assistant Professor and Curator. “Every little girl, all over the country, within two weeks of the release of Joan Crawford’s picture, felt she would die if she couldn’t have a dress like that” (Vogue, 1993). The number of imitations of the white gown that were sold is uncertain. New York Macy’s store calculates they sold 50,000 copies, while the founder of the Modern Merchandising Bureau, the intermediator between Hollywood studios and manufactures, “keen to emphasize the success of the enterprise, exaggerated the numbers that were sold to 500,000” (Butchart, 134). Regardless, the gown had a major effect on American apparel and is an example of how film can influence what people wear. 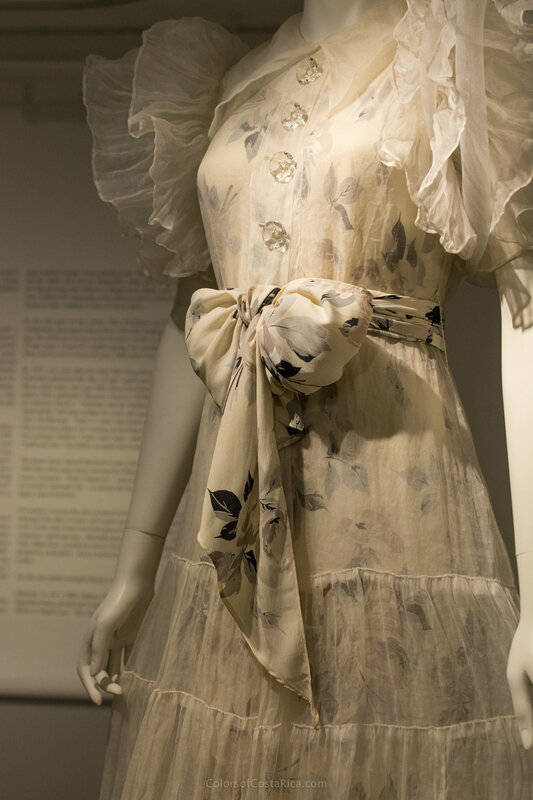 Elsa Schiaparelli (1890-1973), Italian-born fashion designer, declared that it was her idea to emphasize the shoulders; however, Adrian is credited with spreading the concept to a larger audience by designing the dress for Crawford’s film. At the time, approximately 75 million people went to the movies every week in the USA (Butchart, 134). 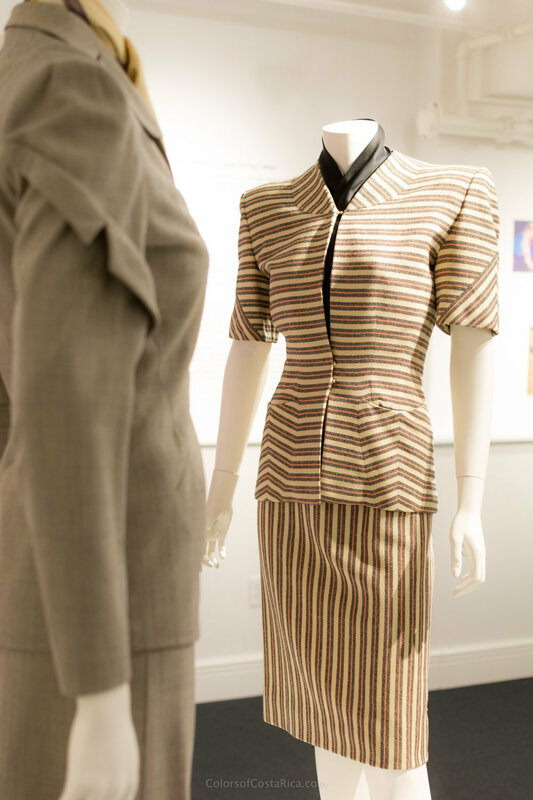 As the costumes’ background stories are exposed, the exhibit’s target audience expands from fashion admirers to anyone with enthusiasm for film and history. Visitors walk around the gallery, circling the garments in awe; they stare at the wall panels, reading about Crawford’s life and Greenberg’s designs. Dr. Monica McMurry, Dean of the Design School, points out at a photograph placed inside a glass-top display table, as she talks with Dr. Hall-Araujo. The image shows Crawford and two other Stephens College students. Beside it, there are a few letters the actress wrote to Stephens president, James Madison Wood. Crawford, who at the time was called Lucille “Billie” Cassin, obtained a work-study scholarship that allowed her to attend Stephens College. Shortly after, Billie decided to leave, “with nothing more than elementary education in her academic past, she was not an ideal candidate for college courses” (Spoto,13). However, she was determined to become a star; she began her career as a stage dancer, and eventually became a television and film actress. In 1945, Crawford won the Academy Award for Best Actress for her role in the movie Mildred Pierce. It is daunting to realize that this exhibition offers the history behind a few selected objects, which were pulled from Stephens collection of more than 13,000 artifacts. Thirteen thousand more tales lay in the Costume Museum & Research Library archive, which was established in 1958, and has mainly grown by donations. The oldest artifacts are dated back to the 18th century; however, the museum’s biggest strength is in the 20th century. The collection includes items from designers like Chanel, Dior, Valentino, Norman Norell and Bonnie Cashin, among others. Besides items for exhibition, the museum has garments for education, which allow students a hands-on experience, where they can touch and study how garments were constructed. “Students can work as docents, they can do independent studies, they can do work study, or work with exhibits or at the archives”, says Dr. McMurry. Cole explains that although students are encouraged to contact her or Hall-Araujo to come to the museum or explore a topic through the study of the collections’ items, most students do not do so, unless they are taking a class that visits the museum. “I had pattern-making classes come in last week for inspiration, the teachers make them utilize what we’ve got, because they understand that this is important, and that they can learn a lot and can be inspired” … “You kind of have to drag them over here, but then they are so grateful, and want to come back”, added Cole. Some students are here tonight, as they walk in the room, their amazement generates “wows” and “awws”, they talk to each other, pointing out their favorite garments. Not all are fashion students, but they don’t have to be. “There were a couple of students that came in (to the exhibition), one of them is a film fan, she is not so interested in fashion, or anything like that, but for her, it was interesting from the film side. Joan Crawford was a student here, just to see what it was like to attend Stephens almost a hundred years ago is pretty interesting”, states Dr. Hall-Araujo. As the night progresses, visitors begin to leave. Soon, the room will return to the silence typical of museums, and the ethereal dresses will be surrounded by nothing but their own beauty. One can only hope that if you were present, you will return, that you will spread the word, that a spark of curiosity for our history awakens in you. One can only hope that the next time you walk in front of the Lela Raney Wood Hall, you remember, now you know what lays in the mezzanine. This essay was a project for my Media Writing and Production class at Stephens College. Vogue, New York. Does Hollywood Create? February 1993. Butchart, Amber. The Fashion of Film: How Cinema Has Inspired Fashion, 2016.